Companies spend a great deal of time and money building their brands, and while the ultimate goal is to sell product, they achieve this by building and sustaining consumer awareness and preference. They build awareness and preference through multiple marketing channels; however, when it comes to the final decision-making, what is on shelf and its relationship with the consumer is what seals the deal. This may be easier if it’s a unique product or a brand that people are clamoring for but what about products that are more common in their everyday use? Take beans, for example, a commodity with a history as an economy food. Until now, I didn’t think there was much new in the world of beans but standing in front of the beautiful bean world of Bush’s Best®, I clearly realize I am very wrong. 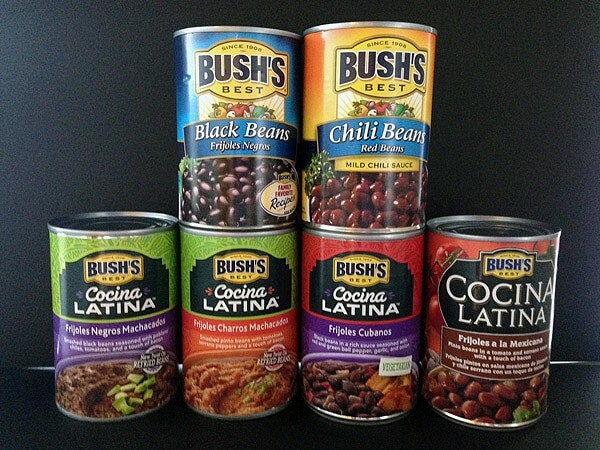 I have never given consideration to the remarkable job Bush’s has done in creating a well-organized brand family of products, elevating beans into a category onto itself. Ranging from the original line of basic baked beans, to organic, low sodium, chili, Grillin’ and now to its Cocina Latina line, as the name suggests, Latin-inspired beans. From its very familiar bright blue packaging of the original baked beans (which on its own is a very dynamic package on shelf), Bush’s wisely uses the architecture of that label design and effectively extends it to cover about eight or nine different styles of beans, broken down into varying flavor options. What works well is the consistent brand presence of the product family on shelf. The hierarchy of communication creates a logical, prioritized presentation of information, guiding the consumer intuitively and logically through the design. Repeated use of this system trains the consumer to quickly check in on key communication points as the design grid repeats across products. At no point has Bush’s strayed from its principal communications system, and yet there is enough latitude in the design that it can incorporate unique nuances for future products. The Bush’s logo remains first and foremost the most important communication message. A color band designating product type, flavor or style description, leading into a strong product visual of the package content, follow this. In each of the broad product categories, the typography is large enough to be easily and quickly legible, and then color helps to group, define and unify the overall product line. Swapping out background color for each category of product identifies a product differentiation but the graphics remain unified by the consistent treatment of color. The recent deviation to the color scheme in the Cocina Latina products changes the background color to a two-color format with a festive background pattern, and a reduction in the Bush logo relative to the overall size of the package – BUT – the logo still has impact as the first element on the label reversing out of a solid black field. Although a different font, the messaging follows the same structure as the balance of the Bush’s packaging approach. I am impressed. The humble bean has been elevated to a creative, quality food product that no longer is perceived as an inexpensive commodity product through a very effective package design system. Bush’s Best has moved beyond the basic baked bean and created a bean empire that is thirsty for more creative and unique uses of the product. With the system it has created, the company is well prepared to keep expanding its brand without skipping a beat. I can already think of several Mediterranean based products that would be nice additions to the product line. It will be interesting to sit back and see where this family of products goes next. If you need help in establishing packaging for additional products to enhance a product line, contact us at 920-725-4848 or info@brand-directions.com. Throughout our 60 plus years in supporting customers with consumer brands large and small, we apply our experience and expertise to the entire process to create efficient and effective solutions.